Click the "Contacts" tab on the main window. Click the "Contacts" command in the Go menu. The Contact List displays your contacts and distribution lists. Rows can be sorted, filtered, and grouped. 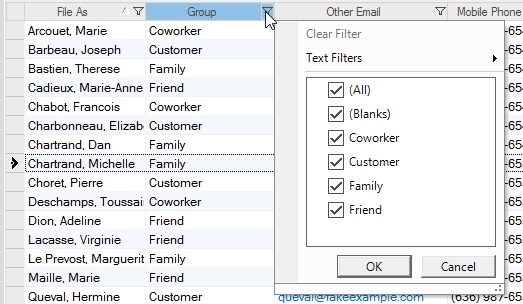 Contact data can be entered directly in the list, or a contact can be opened in the Contact Editor by double-clicking its row. The Contact List also shows search results. 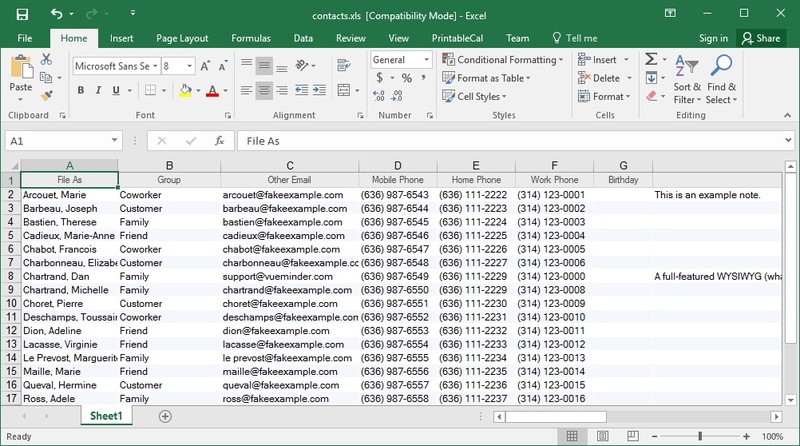 Data can be directly edited in the Contact List, similar to a spreadsheet. To edit data, click its cell and then type the desired value. Note, some fields, such the contact's notes, can only be edited in the Contact Editor window. The displayed columns can be customized by clicking the List button and selecting columns from the Columns submenu, or by right-clicking the column header. A list of columns will be displayed where columns can be toggled on or off. Columns that are displayed will have checkmarks. The names of most columns are self-explanatory. 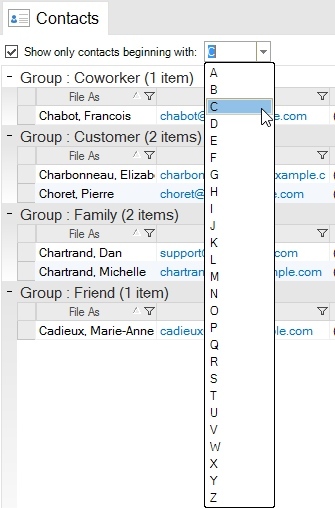 The "File As" column acts as the primary means of identifying a contact, and is usually in the format of "Last Name, First Name" for easier sorting. If using the Ultimate version, an additional "Custom Fields" submenu will be shown, where columns for custom fields can be made visible in the Contact List. To group similar rows, based on column value, right-click the column header and select the "Show Group By Box" command. Next, drag the column you'd like to use for grouping into the box at the top of the list. 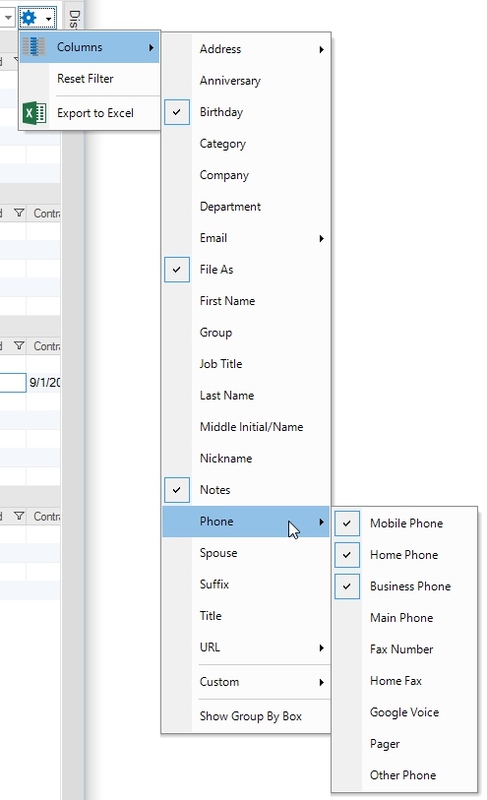 For example, if you want to group contacts based on the Group/folder field, drag the Group column header into the box. The list will update to group the rows together. Grouped rows can be expanded or collapsed by clicking the expansion indicator. A description of the grouped rows, and total row count for each grouping, will be displayed next to the expansion indicator. To group by additional columns, drag the desired column header into the Group By box. 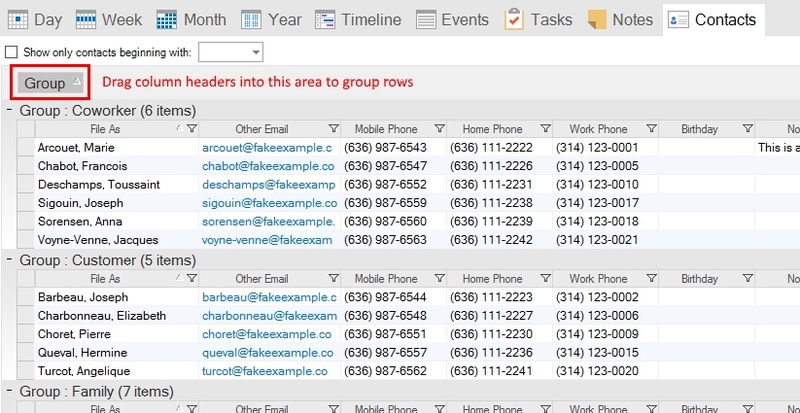 Complex nested groupings can be defined by dragging multiple columns into the Group By box. To remove the grouping for a column, drag the column name out of the Group By box. If all columns are dragged out of the Group By box, rows will no longer be grouped. Note, toggling off the "Show Group By Box" menu option while rows are grouped will not remove the grouping. It will only cause the Group By Box to be hidden. The Group By Box needs to be visible in order to add or remove row groupings. To search for a contact, type the desired search term in the Search box and press the Enter key. Previous search terms can also be selected from a drop-down list in the Search box. After commanding the search, a tab will be added at the bottom of the list, and the list will update to show only the contacts (if any) that were found containing the search words. You can command multiple searches, and each search will be added as a separate tab. The search result tabs will dynamically refresh as contacts are created or modified. To remove a search tab, click the tab's X button to close it. If all search tabs are closed, the full contact list will be displayed. You can also click the red X in the search field to remove all search tabs. To quickly filter the list to only show contacts whose File As field begins with a certain letter (or letters), check the "Show only contacts beginning with" box, and then select or type the desired letter(s). For example, to only show contacts beginning with "C", type C. To only show contacts beginning with "CH", type CH. To return to showing all contacts, uncheck the "Show only contacts beginning with" box. More advanced filtering is also provided and described below. Each column header contains a filtering icon. If the column is not being filtered, the icon will display as an empty filter or funnel. When filtering is active, the icon will change to be filled in. When the filtering icon is clicked, you can choose to filter rows based on the content of the column. The following filtering selections are available. Uncheck an item to filter it. (All) - No filtering for the column. (Blanks) - Only rows with blank cells in the selected column will be displayed. Value - The values for each row will be displayed in the filter list. Uncheck a value to remove it from the displayed contact list. 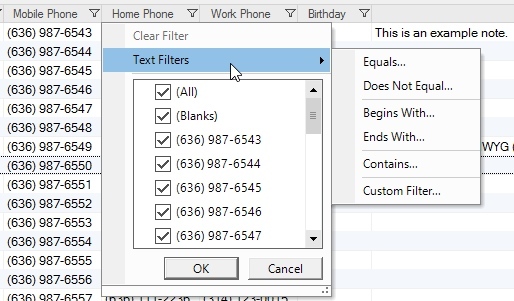 Advanced filters can be specified by expanding the Text Filters menu. Selecting any of these advanced filtering commands will result in a filtering dialog being displayed, where one or more custom filtering conditions can be specified. Use the Operator and Operand values to define the filter. Click the "Add Condition" button to make a compound filter. In the example below, the Business Phone column is being filtered to only show contacts whose phone numbers begin with area code 314. After you're satisfied with the filtering condition(s), click the OK button to apply the filter. After a column is filtered, its icon will change to be solid, as shown in the example below. Multiple columns can be filtered at the same time. To clear the filter, click the filter icon and select the "All" option or click the gear button in the upper-right corner of the Contact List and select "Reset Filter". The contents of the current list can be exported to a Microsoft Excel formatted (.xls) file by clicking List button and selecting the Export to Excel command. 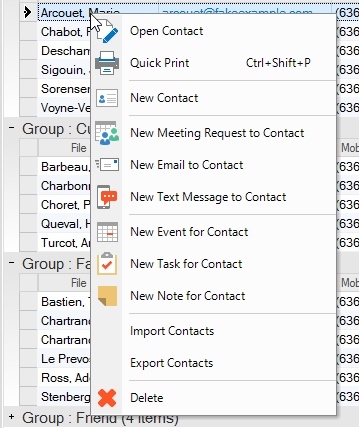 Note, if you want to export all your contact data, and not just the currently displayed list/columns, use the Export Contacts command on the File menu instead. The current list will be exported to the specified file name. If the file already exists, you will be prompted to overwrite it. If you have Microsoft Excel or another program capable of opening Microsoft Excel formatted files, you can choose to view the exported file after the export has been completed. This is an example of how the exported list appears when opened in Microsoft Excel 2016. Note the first column is the Complete column. If a row is checked in the list, its Completed value will export as TRUE. 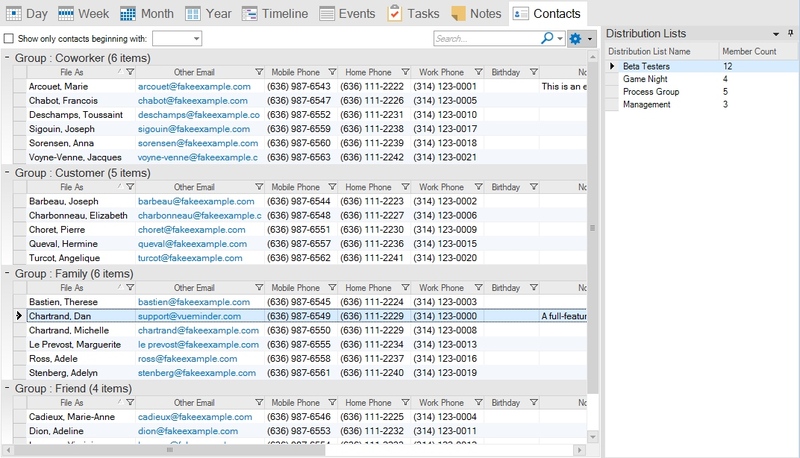 When a contact row is right-clicked, a context menu will display. 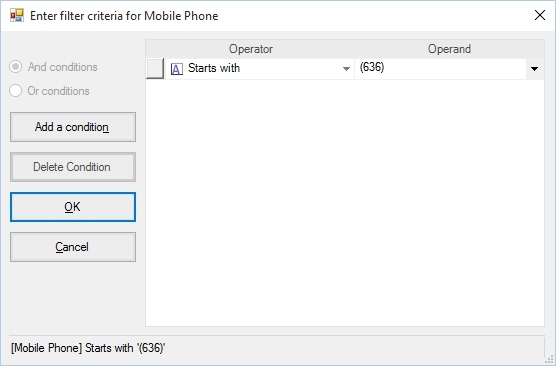 This command will open the select contact in the Contact Editor, where the contact's data can be viewed or modified. This command will print the selected contact(s). The print layout is similar to that shown in the Details Pane for a selected contact. This command will command the Contact Editor to be displayed for a new contact. After entering at least the contact's File As value, the new contact will be added to the list. This command will create a new meeting request to the selected contact(s) and display the meeting request in the Event Editor, where the details of the meeting request can be specified. The meeting request will be sent via email, so this command will only work correctly if your email settings have been configured and if the selected contact has an email address specified. This command will initiate a new text message to the selected contact(s). The Send a Text Message window will be displayed, where the text message can be typed and additional recipients selected. Note, this is not the same thing as a text message reminder. The message will be sent as soon as it has been typed, and can contain anything you'd normally send in a text message from your cell phone. This command will create and link a new event to the selected contact(s). The title of the new event will default to match the selected contact name(s). The selected contact(s) will also appear in the Links tab of the Event Editor. This feature could be used for scheduling appointments or service calls for contacts. This command will create and link a new task to the selected contact(s). The description of the new task will default to match the selected contact name(s). The selected contact(s) will also appear in the Links tab of the Task Editor. This command will create and link a new note to the selected contact(s). The selected contact(s) will appear in the Links tab of the Note Editor. This command will result in the Import Contacts window appearing, where contact data can be imported. After importing, the Contact List will update to show new or updated contact data. This command can be used to export your contact data to a CSV file. Many other contact programs are capable of importing data from CSV files. This command will delete the selected contact(s). If you accidentally delete a contact, the Undo command on the Edit Menu can be used to restore the deleted contact data.